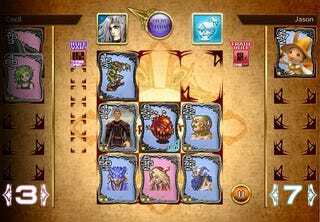 Sixteen years after the release of Final Fantasy VIII, Square Enix has finally released an official stand-alone version of its legendary card game, Triple Triad. You can get Triple Triad right now on both iOS and Android by downloading the Final Fantasy Portal app. Both the Portal app and the card game—which you download inside the app—are totally free. You can build a collection of cards based on every Final Fantasy game, cycle through Triple Triad rules, and challenge both AI and human opponents—basically, it’s everything you’d expect from a Triple Triad mobile game. The catch? Well, since this new version of Triple Triad is free, and Square Enix needs its sugar, there’s a stamina system that limits how often you can play. Every match costs a crystal. You can hold five crystals at once, and when you’ve got fewer than five, you’ll gain one back every 30 minutes of real time. Or... you can spend real money to buy them. Because video games. Still, it’s Triple Triad! On your phone! Final Fantasy fans have craved this exact thing for years now, and now it’s finally here.